Alexa, Amazon’s cloud-based voice service, powers voice experiences on millions of devices, including Amazon Echo and Amazon Fire TV and Fire TV Stick. Today, Amazon brings Alexa to more devices with its two newest additions: Echo Dot and Amazon Tap. Echo Dot is a hands-free, voice-controlled device that enables you to add Alexa to any room. 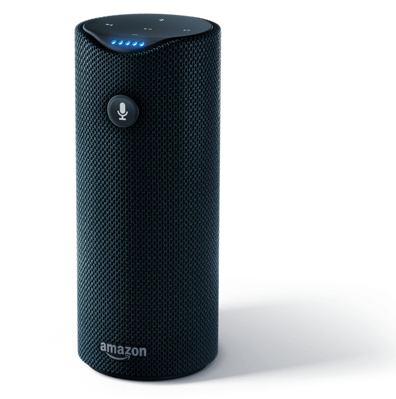 Amazon Tap is an Alexa-enabled portable speaker. Alexa—the brain behind Echo Dot—is built in the cloud, so it is always getting smarter. The more you use Dot, the more it adapts to your speech patterns, vocabulary, and personal preferences. And because Echo Dot is always connected, updates are delivered automatically. Third-party skills from developers add even more capabilities like ordering a pizza from Domino's, requesting a ride from Uber, opening your garage with Garageio, and more. Enabling skills lets your Echo Dot do even more—simply discover and enable the skills you want to use in the Alexa App. Amazon Tap is a portable Bluetooth and Wi-Fi enabled speaker that gives you rich, full-range sound. Dual stereo speakers with Dolby processing offer crisp vocals and extended bass response. And unlike other Bluetooth speakers that only face forward, Amazon Tap has dual stereo speakers that provide immersive, 360° omni-directional audio. When connected to Wi-Fi or a mobile hotspot, just tap the microphone button and ask for music, hear news, search for information, order a pizza, and more with the Alexa Voice Service. Amazon Tap ($129.99) starts shipping later this month. The Alexa Skills Kit enables developers to add capabilities, or skills, to Alexa. 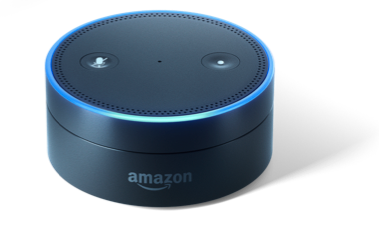 Hardware manufacturers can also integrate the Alexa Voice Service into their own devices. To date, third-party developers have added over 300 third-party skills to Alexa and hardware manufacturers like Ford and Invoxia have announced Alexa-enabled prototypes. All skills published by March 31st will receive an Alexa dev t-shirt. Quantities are limited. See Terms and Conditions. Remember, you can get started quickly using the trivia skill template.